SBI has launched Twitter Banking to access many online services on Twitter. If you are using Twitter social media platform and have SBI account then you can try this new Banking facility. 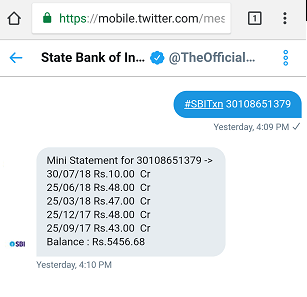 With Twitter Banking (mingle), you can check your SBI account balance & statement, transfer money to other bank accounts, block your card, request new Cheque book, stop cheque payment etc. 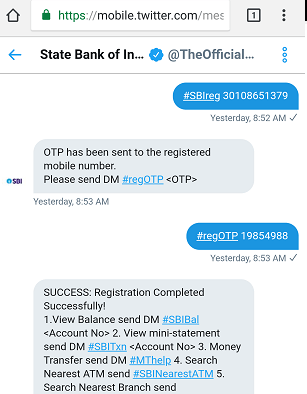 Type #SBIreg<space>Account number (Example: #SBIreg 3019838338), please don’t forget to add # tag. Now you will receive an OTP on your registered mobile number, you need to DM this OTP. After sending OTP, your regisratuon process complete. Now you can use different services by sending DM. Now see how to avail different Banking services on Twitter by sending DM. Please type DM message in the correct format. You can also place a request for new Chequebook and it will be delivered to your mail address. 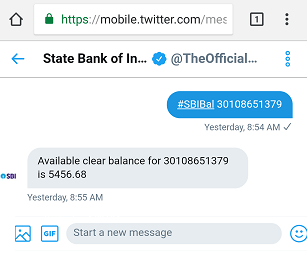 You can also transfer money to other banks account by sending DM on twitter. You will receive an OTP, you need to send this OTP through DM. You can also Block your ATM card on Twitter by sending DM. Tip: Please use (#) for every DM, else it will not work. Type DM message in the same format, no change in letters. Do this is how SBI customers now access banking services through the Twitter account. If you are a Twitter user then you will love this feature.